This project proposes a general architecture to connect HOL Light, a higher-order logic theorem prover, to mechanized mathematical systems, based on the use of the mathematical standard OpenMath. 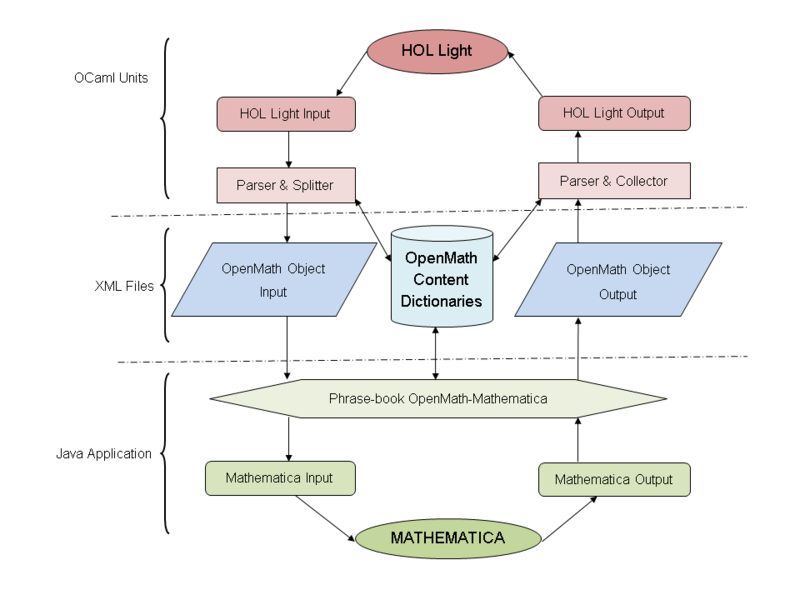 In particular, we implemented a prototype tool linking HOL Light to Mathematica as a Computer Algebra System through OpenMath. We developed a HOL Light translator which converts HOL Light statements into OpenMath objects and vice-versa. We also use a Phrasebook to connect OpenMath to Mathematica as illustrated in the figure below. Our prototype tool (HolMatica) is available for download at the web link provided below. It has been applied on several running examples such as evaluating eigenvalues of a real matrix. S. K. Afshar, U. Siddique, M.Y. Mahmoud, V. Aravantinos, O. Seddiki, O. Hasan and S. Tahar: Formal Analysis of Optical Systems; Mathematics in Computer Science, Vol. 8, No. 1, Springer, May 2014, pp. 39-70.